Although very similar in name, resin bound and resin bonded are actually very different. This system mixes natural aggregate, marble or recycled materials and clear resin thoroughly together. During this process, each particle of stone is fully covered in resin and laid immediately onto a base, to a smooth permeable finish. The finished depth of a resin bound paving surface varies between 12mm and 24mm – depending on the size and type of stone used and the application (e.g. driveway). Using a resin bound paving system allows us to combine different sizes and colours of stone, offering a wide variety of finishes. In summary, a resin bound system delivers a permeable, durable, accessible, multi-layer surface. Because the finish is smooth there is no loose stone – guaranteed. This system involves applying a film of resin to the surface, on top of which clean, dry aggregate is scattered; completely covering the resin. Once cured, any excess stone is swept up. 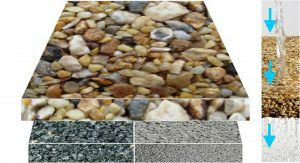 The size of stone used in the resin bonded system ranges from 1mm to 6mm. The thin, impermeable, single stone layer tends to have a rougher more textured finish. 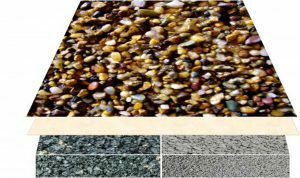 In summary, a resin bonded system delivers a non-permeable, single stone layer surface. Because the stone only adheres to the resin on one side, there is potential for the stone to become loose and scattered. Visit our page on sustainability for more information.